﻿ I met a ghost that wasn't there. I met a ghost that wasn't there. For me, it's one of two things. First, multiple witnesses over time that with some research, you can rule out the possibility that all the witnesses were corrupted by one another's testimony or indeed, expectations set up thanks to media or hearing old stories from others. (Not just another contemporary witness, but hearing about a historic and oft seen grey lady apparition at a site can make any shadow into the same grey lady... but is it?) Still, if you have many witnesses over time and indeed, the place may warrant the reputation. Second is a well documented mythology... a ghost not often experienced, but the story has been handed down from person to person and perhaps even published or presented in the media. The stories may indeed be only stories, but if the legend is there, it's haunted... and there may be something to it... or nothing. Regardless, a good legend should have some basis in historic fact which can be easily looked up or inquired about... it may not match the ghost story, but if the legend can be seen in the historic facts, there's a good reason to call that place a haunted site... if for no other reason, for folklore's sake. The only place that second one may transgress into bad territory for me is sites that garner attention due to dares, bored kids, or the something similar. In order to 'spice up' a dark and stormy night, a story is made up or an event conveniently relocated to a better spot, in which a group can entertain itself in the haunted location. These can muddy the waters greatly. In our free coursebook, I use the example of the ghostly children that died in a bus/train collision that now push cars up hills and even leave hand-prints on the vehicles. This legend is reported as absolutely true in no less than (currently) four states in the US and in two places in Canada... and thanks to Snopes, the entire origin doesn't hold any water regardless of location and was a lie made up to explain a "gravity hill" which has nothing to do with ghosts and are only optical illusions... click here for information about these illusions. In essence, I should be able to research it. Now, this is (again) NOT to say that if someone experiences something "one off" somewhere where an earlier report does not exist then it's a non-starter... no, it's just that the site the experience has happened in, at the moment, should not really be tagged with the reputation of being haunted. What about places that look or "should be" haunted... and aren't? In Toronto (and around the world, no doubt!) there are plenty of creepy, old, interesting, and even historic sites that indeed, defy having a 'paper trail' of ghostly experiences... in a couple of cases, barring what's now being marketed or suggested over the last decade or so. I shan't bore you with the obvious ones... like Toronto's Necropolis burial ground or Mount Pleasant Cemetery (we've already covered why almost all cemeteries don't fit the criteria... but again, people WANT them to have a good lore so badly... and I've never really understood why.) For the record though, no matter how much people would appreciate it and indeed, no matter what you may have heard, no old ghost stories, fables, or indeed, good reports from any of Toronto's better known burial grounds... be they ghosts of those interred (almost never the case anywhere!) or those who visited or tended the sites while alive. 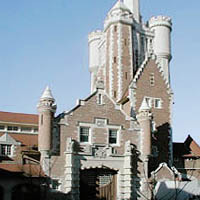 Casa Loma is also a good example. Oh, I did find one... a report of the sound of horses being heard in the tunnel between the castle and the stables. This despite no horses being on site at the time the sounds were heard. Two separate witnesses at different times reported this, and initially we thought it sounded... odd. After all, why would horses haunt a tunnel that led from the stables into the castle itself? 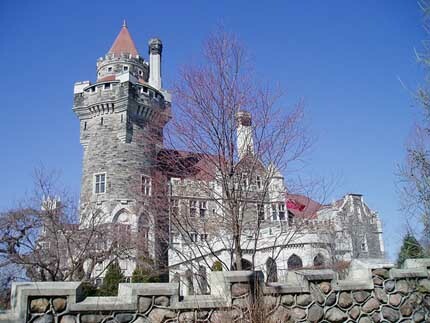 This said, we were told there was a potential for this through a staff at the historic site next door to the castle, Spadina House, who said that Sir Henry, the castle's builder, did use the tunnel to move from the stables to the garden to avoid the public thoroughfairs. This was backed up by Austin Seton Thompson's book, "Spadina: A Story of Old Toronto" when he mentioned that the tunnels were completed before the castle and indeed, they were used to get to the gardens without passing through land that did not belong to Sir Henry. Did Sir Henry pull horses through the tunnel, not to the castle which wasn't built yet, but to his gardens? It still seems unlikely... but the possibility is there albeit remote. Still if one accepts this as fact, this means the only repeated ghost story with documentation doesn't even happen in the house proper. People want the castle to be haunted... and not just the ghost tour folks... but sadly, as Mr. Colombo put it, "the castle lacks a ghost to call it's own." In the office towers of Toronto, we also come to places bereft of ghostly activity... despite in some cases, a wonderful antiquarian setting. The original Scotiabank building, the current home of CIBC Melon on Bay St., the original Commerce building... all amazing and wonderful in their Victorian, Edwardian, and Art Deco splendour... are all lacking ghost stories. Even the Pantages Theatre (now the Ed Mirvish Theatre) doesn't have what it's neighbour to the South, the Elgin/Wintergarden Theatre has... a long-lasting good ghost story. ...and nothing screams MUST BE HAUNTED to bad ghost hunters than an abandoned building. Abandoned home? Must be a crime scene... or the owners fled because of ghosts... or it was inherited by someone with bad memories of the location and are leaving it to rot. Abandoned health care facility? Obviously a place of torture and inhuman experiments. Abandoned business? Probably illegal... or immoral... or related to organised crime and therefore a place of violence or worse. If it's an abandoned funeral home, well, do I need to say anything more! Abandoned home? 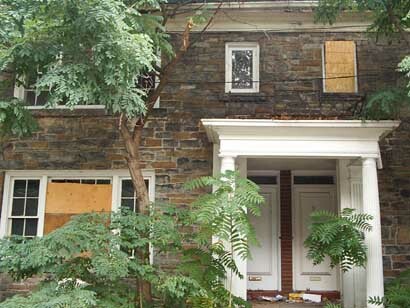 Waiting to be demolished or retrofitted. Might be a situation of a contested will. In a couple of cases, we've heard of people "skipping the country" and dodging mortgages, bills, and taxes... and the bank or whomever are simply waiting for a proper lean or indeed, a full repossession. Abandoned health care facility? Read the papers... there are cuts to health care all the time. They may also be a situation where better facilities were created or appeared and the older one's left to stand until a decision on their fate is determined... and with the government, that can take decades. Abandoned businesses? Probably they simply went out of business. On the negative, a bankruptcy or the like. On the positive, a retirement with no prospect of continuing trade and (again) awaiting new property use. I have a fondness for visiting High Park in Toronto... and to the direct North, there was an entire block of wonderful old homes... most dating from the early twentieth century. The homes were acquired over many years, one by one, and left abandoned... for years... until the last owner parted with their property and only over the last year has demolition taken places to make room for (surprise!) high rise condos. ...which, that site? South side of High Park? No ghost stories from there. Nearby in the pond, yes. The historic home (Colborne Lodge) even closer to this potential burial site, yes. The burial site itself, nothing. 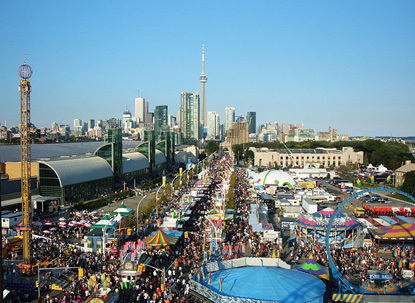 ...so many places in Toronto... so many places that could/should/would... but don't seem to be haunted. ...but up until that moment, no one bothered to tell someone who wrote about it in a newspaper, journal, newsletter, book, television news item, or radio program. ...but why can't I find anyone else? I have the books, tapes, online resources, access to libraries. Does the need to believe sometimes force a place to have a haunted reputation despite the lack of ghosts? Actually, would anyone really argue that? ...but isn't that the case regardless? This all said, I do wonder, however... how many people have gone to cool looking places and found the ghosts that weren't there. ...and I can look on amazingly at some spectacular, wonderful, beautiful, historic, atmospheric and indeed sometimes creepy places and just think about what could be... and maybe should by virtue only of aesthetics. Obviously the title is not terrific if taken literally. I couldn't "meet" something that isn't there, and I also can't say that any of the specific places I've mentioned are not/could not/will never be places that hit that qualifier I set up at the beginning of this. You may have or had an experience at these sites. You may have one to come. I can only say this... If you were to ask me (as people often do,) where is the greatest likelihood of having a ghostly experience, the places mentioned above would not be the spot. This also means I'm not suggesting DON'T visit or see these places, with the exception of any place that you might be trespassing or may be unsafe, but recognise them for what they are... interesting spots, to some, potentially creepy, but in all honesty, lacking a solid foundation (using the criteria set out above,) to be called"haunted". CAVEAT and addendum: One of our regular readers felt that the point of this article made light of one-off or personal experiences... this was not my intent. The article, in a nutshell, is about buildings that have or gain a reputation as being "haunted"... not an experience, but a site. Personal experiences are the bedrock that our work is built on... up to and including my own experiences... and those are not to be written off or taken lightly and we deeply appreciate any reports that are sent in to us. This said, again, the article above is sites gaining a reputation for being haunted or places that ghost enthusiasts, investigators, and even researchers might go to "cold" looking for data... and that is usually quite different from a personal ghostly experience. I apologise if this was not clear enough or not laid out properly.